Indian Summer Monsoon Rainfall amounts to more than 80% of the annual rainfall over India and the dependence of agriculture, drinking water and energy production on it makes it the lifeline for a large fraction of the world’s population. The economy, life and property in the region are vulnerable to significant variability of the ISM on intra-seasonal, inter-annual and inter-decadal time scales (Webster et al. 1998, Krishnamurthy and Goswami, 2000, Goswami et al. 2006a). Although the year-to-year variation of seasonal mean all India rainfall (ISMR) is only about 10% of the mean (86 cm), there is strong link between the country's food production and even the gross domestic product (GDP) on it (Gadgil and Gadgil, 2006). Hence, predicting the seasonal mean ISM rainfall is of great socio-economic importance and has been attempted for many decades, albeit with limited success (Gadgil et al. 2005, Kang and Shukla, 2006). Forecasting Indian monsoon rainfall has a long history and dates back to 1886. The first official seasonal monsoon forecast was issued by Sir Henry Blanford in 1886 which was based entirely on Himalayan snowfall. John Eliot used extra- Indian factors, viz., and pressure of Mauritus, Zanzibar and Seychelles in the monsoon forecast of 1896. Sir Gilbert Walker who laid the basis for a forecast on a statistical association, was the first meteorologist who systematically examined the relationship between Indian monsoon rainfall and global circulation parameters and selected 28 predictors to issue forecast based on regression equation during the year 1906 (Jagannathan 1960; Rao and Rama Murthy 1960; Rao 1965). Savur (1931) showed that 7 out of 28 parameters have lost their significance in course of time. Since then, extensive research work has been done on empirical seasonal forecasting of Indian summer monsoon rainfall. In spite of several changes in operational empirical models of IMD, based on extensive research work since 1932, no significant improvement in prediction skill of Indian Summer Monsoon Rainfall has realized (Gadgil et al., 2005; Fig.1). At present, IMD uses a statistical prediction system (Rajeevan et al. 2007) for operational long range forecast of the Indian monsoon rainfall. Dynamical predictions of the Indian summer monsoon rainfall with models of the stand alone atmosphere and/or coupled ocean–atmosphere models based on physics have become reality in the last couple of decades because of the rapid developments in weather and climate science and high performance computers. In spite of rapid advances in atmospheric sciences, simulation and prediction of the Indian monsoon remains a tough challenge (Wang et al., 2005, Gadgil and Srinivasan, 2011). 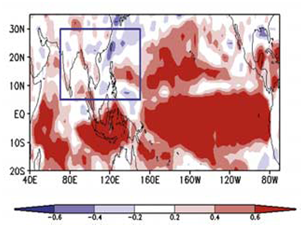 Wang et al., (2005) have shown that the state-of-the-art atmospheric general circulation models (AGCMs), when forced by observed sea surface temperature (SST), are unable to simulate properly Asian-Pacific summer monsoon rainfall (Fig.2). Fig. 2: Correlation coefficients between the observed CMAP (1979–1999) and the simulated June–August precipitation anomalies made by five-model multi-ensemble mean (adopted from Wang et al., 2005). There is considerable observational and modeling evidence that the Indian summer monsoon (ISM) is governed largely by coupled ocean-atmosphere processes. 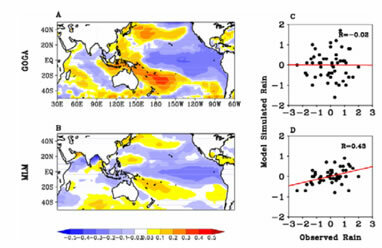 For example, ENSO is a major driver for ISM and as ENSO is clearly a coupled phenomenon, a coupled ocean-atmosphere GCM is crucial for monsoon prediction. In yet another study, Kumar et al. (2005) have shown that the “perfect model skill” could reach up to 0.65 if the SST could be forecasted accurately. But, the actual simulation skill of an AGCM is much lower than this, however, they have discovered that the skill improves significantly once the AGCM is coupled to a mixed layer model suggesting that monsoon prediction involves the coupled ocean-atmosphere processes (Fig. 3). An attempt to assess the skill, of standalone atmospheric models used in India, in simulating the inter-annual variations of the ISMR by prescribing observed SST was taken up in 2004/2005 under the Seasonal Prediction of Indian Monsoon (SPIM) project sponsored by the Department of Science and Technology (DST). This exercise was meant to provide the measure of potential skill that can be achieved by these models, which is not exactly the prediction skill. The results of this project showed that only one model is having moderate skill of 0.39 in simulating the inter-annual variability of ISMR and other models do not show any significant skill. The prediction skill of these models is not known. All these findings laid path for looking at coupled ocean-atmosphere models for possible improved seasonal prediction of monsoon rainfall. Recent studies have examined the skill of coupled models in predicting the ISMR and noticed that the skill is better than the empirical models and standalone AGCMs. Preethi et al. (2010), using a set of 7 fully coupled models from European centers (DEMETER), have shown that the multi model ensemble skill of these 7 coupled models is about 0.28, however, the individual model skill varies between -0.3 to 0.43. In a subsequent study, Rajeevan et al. (2012) have shown that the skill of individual models and multi-model ensemble (MME) is further improved in the state-of-the-art European models (ENSEMBLES) with improved physics and dynamics. The skill of the individual models varied between 0.27 and 0.45.